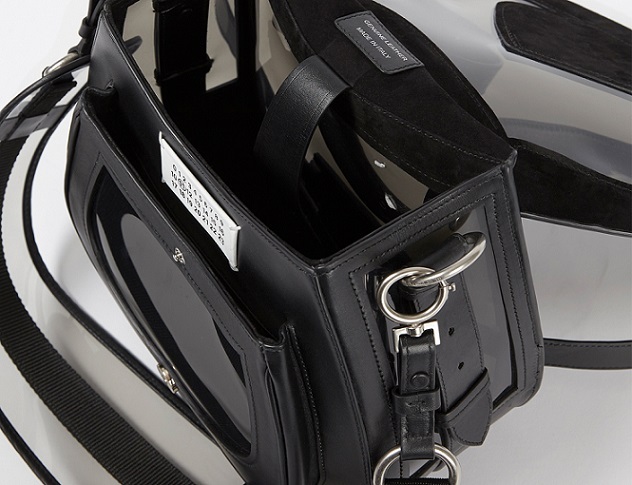 Maison Margiela Bag-Slide is the absolute incarnation of this visual dialogue: versatile, modern, lightweight, it moves with the body and can be worn in a variety of different ways to reflect the wearer’s needs and mood. The Bag-Slide is true to the Maison Margiela ethos, based on the shape of a classic hunting bag yet presenting this original inspiration in a radical new manner. The name Bag-Slide is a reference to the skateboarding term ‘back slide’. With a single gesture, the bag can be flipped and transformed into a variety of different styles, a direct reflection of the urban poetry and sense of motion inherent to the skateboard movement. The Bag-Slide is presented in three sizes: the original large size, a miniature version and an intermediary, elongated style. The braided leather top handle allows the wearer to carry the design as a traditional handbag. The two longer, detachable shoulder straps can worn together or individually, positioning the Bag-Slide as a backpack or a cross-body. The medium-sized incarnation features a single adjustable and removable strap, allowing it be be worn as a cross-body or a shoulder bag. The AW2017 Avant Première Collection features the Bag-Slide in an array of new materials, colours and finishes, from monochrome smooth leather to two-tone grained calfskin, nubuck, velvet, and printed quilted nylon. Natural tones of grey, brown, and kaki are complemented by vibrant shades of pink, ruby and royal blue. The Bag-Slide’s modern edge and adaptability was showcased on the Maison Margiela SS17 catwalk and will be featured again in forthcoming collections.